Australian researchers are extremely fortunate to have a vast treasure trove of material available to unlock a families' past. Particularly when using the Internet for research, the many threads which make up an individual's life can be woven together and tell a complete story. The combination of Government resources, free site and commercial research tools provide many opportunities for the researcher. Lost Medals Australia (http://www.lostmedalsaustralia.com/ and http://lostmedalsaustralia.blogspot.com.au/) was established in 2000 with the goal of returning lost medals to veterans or their families. Over the last 13 years 1250 medals have been returned after they have been dropped in the gutter on Anzac Day; recovered by the Police following a robbery; discovered in a draw of an empty house or found for any number of other reasons. To reach this number of returns a well established research methodology has been developed which predominantly uses sites available on the Internet to locate a family and ultimately return a medal. This guide does focus on researching an Australian serviceman but the principals will make it easy to broaden to other search types. In most cases, it is knowing where to look that makes further research possible. When researching an Australian who served during WWI or WWII there are some very good resources available. The first is the website of the Australian War Memorial (AWM) (http://www.awm.gov.au/). The AWM People search page (http://www.awm.gov.au/research/people/) has facility to search their whole collection for a specific name. However, there is also the ability to narrow the search to, for example, the WWI nominal roll, WWII prisoners of war and the Roll of Honour. Probably the best recourse available on the Internet for researching an Australian serviceman is the National Archives of Australia (NAA) (http://www.naa.gov.au/). In recent times the Australian Government funded a project to digitise all WWI service records and make them available free online. The NAA's web page Mapping Our Anzacs (http://mappingouranzacs.naa.gov.au/default.aspx) is a very good place to start and an individual's record can be accessed straight from this page. However, the following guide is provided so that the user can see how all the NAA collection can be accessed, not just the WWI records. It is not necessary to register on the NAA site as there is the ability to search as a Guest. However, registration is free and is required if a hard copy record needs to be requested. On the NAA home page (http://www.naa.gov.au/) you will see the link 'Search the Collection'. Click on 'Search the Collection' and this page has a link to 'Begin your Search' or 'Register'. You can register or log in on this page. However, as mentioned registration is not required. By clicking on 'Begin your Search' a page will open that offers five tabs on the top of the page. Each of these tabs will take the researcher to different areas of the collection. For this example select 'Name Search'. When the 'Name Search' page is selected a search box and drop down box will appear. Enter the family name and from the drop down box select the category of record, for this example World War I. So that this guide can continue an example search will now proceed. Enter Simpson in the 'Family name' box. Once 'Search' has been selected the initial results will be provided. This example show that 579 people by the name of Simpson served during WWI. Below the results there are two tabs which will assist with the next step. By selecting 'Display' all the 579 results will be listed. The 'Refine this search result' tab allows the search to be narrowed. If the individuals first name or regimental number is know select this tab. The 'Refine this search page' offers two more search boxes. For this example enter the given names of John Kirkpatrick. The results of the narrowed search are now provided and in this case there is only one record for John Kirkpatrick Simpson. This is the service record of Simpson and his Donkey. By selecting 'Display' a one page synopsis of the record appears which provides basic details about the soldier and also important NAA information about the record status and its location. At the top of the record summary is a link that says 'View digital copy' and next to this is a page icon. Click on either of these and the service record will open. Simpson's service record totals 84 pages and provides considerable detail about the man and some correspondence about his service well after he died. Not all service records are as detailed, with some only a few pages long and providing sparse details of enlistment and discharge. If a soldier was hospitalised the record will contain these details but exactly where the soldier fought and what action he was involved in is usually not included. For any one interested in the medals awarded to an individual the last page will show three stamps which are the shape of the 1914-15 Star, the British War Medal and the Victory Medal. These stamps will have a number on them to indicate the schedule number which authorised the award of the medal. If the initials 'NE' are on the stamp this means the individual was Not Entitled to receive the medal. If the individual was awarded a bravery or gallantry medal the citation may be included in the service record. This guide is designed to step the researcher through finding the basics about an individual's service. The same steps can be used to track down a WWII soldier. Not all WWII records have been digitised but they can be requested (http://recordsearch.naa.gov.au/scripts/ECommercePassData.asp?B=4028778&NS=Y) which incurs a fee. Lost Medals Australia is interested in locating the descendent of the serviceman so that any medal can be returned. After the basics have been established it then becomes a search through the records to follow the individual and determine who their children, grand children and even great grand children are. State based Births, Deaths and Marriage records. Access varies from state to state. One example is the NSW records (http://www.bdm.nsw.gov.au/familyHistory/searchHistoricalRecords.htm). The Ryerson Index (http://www.ryersonindex.org/index.htm) is a collection of death notices sourced predominately from NSW papers. There are also links to news paper archives so that the full death notice can be seen. This often provides the names of family members. The Commonwealth War Graves Commission (http://www.cwgc.org/) provides information about where servicemen that died are buried and the next of kin details. The Department of Veterans Affairs web site has their own data base or links to nominal rolls (http://www.dva.gov.au/commems_oawg/nominal_rolls/Pages/index.aspx). The National Library of Australia has a wonderful website called Trove (http://trove.nla.gov.au/) which provides access to newspaper archives. As has been stated, an individual's service record does not usually provide much information about the actions an individual fought in. If a soldier was wounded or killed the record might only say that it occurred at Gallipoli or in France. The war diaries of the unit an individual served in might provided more detail about what actually occurred. The war diaries are held at the AWM (https://www.awm.gov.au/collection/records/war_diaries/) and many have been digitised. By comparing the date of wounding or death that is given in the service record and locating the corresponding date in the war diary should provide additional information. These records tend to provide narrow insights about an individual at desecrate points in time. It is the ability to follow the person as they marry, move from one address to another, have children and who they live with that provides the clues for Lost Medals Australia to eventually contact the current generation. Genealogy based websites like findmypast.com.au are essential in these searches by providing access to historical records that would otherwise not be available. Electoral rolls, phone directories, immigration records all go together to build the story which, for Lost Medals Australia, unlocks the present. Photo above right of LT Kenneth MacLeod who was in the second intake of RMC Duntroon and had the Corps of Staff Cadets (CSC) number 55. The first two intakes graduated early from RMC so that they could deploy to Gallipoli. MacLeod was a member of the 13th Battalion of the AIF. He was killed in action on 3 May 1915. 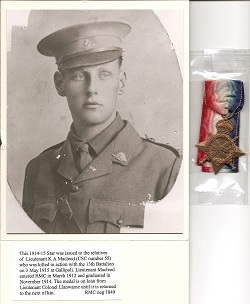 MacLeod's 1914-15 Star was forwarded to Glyn in November 2004 and spent a period of time on loan to the RMC Historical Collection. Glyn returned the medal to MacLeod's niece in December 2007. Glyn Llanwarne hails from Perth, Western Australia. He was educated at Christ Church Grammar School before embarking on a career in the Australian Regular Army. A graduate of the Royal Military College and the Australian Command and Staff Collage, Glyn has seen active service in East Timor, Iraq and the Sudan. Glyn is the founder of Lost Medals Australia, a free service that reunites lost medals with veterans or their families. Lost Medals Australia has returned over 1250 medals. To achieve this result, Glyn and his researchers have established a comprehensive search methodology that has proven to be very effective.